If a cooler could ever earn the right to be described as beautiful, elegant, or sophisticated, Sovaro coolers would legitimately be the ones to do so. They’ve taken the luxury cooler market by storm and crafted some of the most eye-catching, extravagant, stylish, and luxurious (not to mention functional) coolers the industry has ever seen. Who would’ve thought that keeping stuff cold could be such a glamorous affair?! In all honesty, Sovaro Coolers has walked a fine line between functionality and downright ostentatiousness. It was a bold move on their behalf to go so above and beyond for a tool whose sole purpose is to – ahem – keep things cold, but they’ve managed to stay on the right side of that line, and legitimately deserve some praise for engineering and crafting such a state-of-the-art product. Of course, they knew exactly the target audience they’d be marketing their line of luxury coolers to – this is not a product for the blue-collar worker or the gritty hunter/fisherman (for these, you’d better check out our posts covering lunch coolers and fishing coolers). What Sovaro has built, is a lavish, extravagant commodity for society’s wealthy and fashionable – modern day aristocrats, if you will. For example, you might expect to see a Sovaro Cooler on the deck of a multi-million dollar cabin-cruiser, chilling a bottle of vintage champagne during an evening yacht party. Or, maybe on the brick terraza of a Sonoma Valley mansion during a wine party for the rich and famous. Alright, maybe those examples are a little over-the-top, but you get the idea. This is a luxury, expensive cooler intended and marketed for wealthy individuals. That being said, for all the things Sovaro coolers has gone above and beyond on sophistication-wise, they haven’t neglected the core value of performance and functionality. Make no mistake – these luxury coolers will rival anything on the market in terms of ice-retention and durability. TIP: Go and visit this product page on Amazon for more pictures and customer reviews. Cork Insulation / In addition to being a natural insulator, cork is impermeable to gas and liquid, and doesn’t attract mold or mildew. Air-Tight Rubber Gasket / Locks cold air in to ensure a perfect seal with each use. Transparent Divider / Each cooler includes one removable divider for easy organization. Interior Height / Store wine or spirit bottles upright. Friction Hinges / Friction hinges keep cooler lid open and release at halfway point for easy close. Side Handles / Cast side handles feature comfort grip for easy lifting. Wheels / Two heavy-duty, luggage-style wheels provide unmatched mobility. How these features work in practice? Pretty good, we must admit. 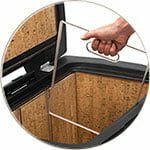 To give you an example, Sovaro coolers have well-designed friction hinges which securely hold the lid in an upright position when you want it to stay open. This is a nice feature as it eliminates the worry of the lid crashing down on your hands while you’re digging through the ice for that last beer (craft, of course). 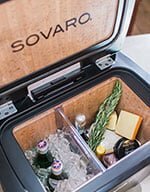 Also, all Sovaro coolers come with a telescoping handle and heavy-duty, luggage-style wheels for easy transport, as well as cast side handles for easy carrying. This is VERY convenient for a cooler of such size. Construction-wise, Sovaro coolers are unique in their use of cork as the insulating material. 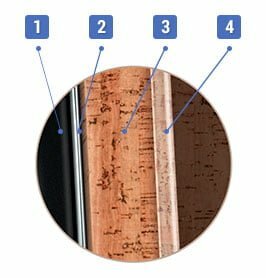 According to their website, cork is advantageous on multiple fronts: it provides a unique aesthetic appeal, it’s impervious to gases and liquids, it doesn’t break down over time, doesn’t attract mold or mildew, it’s renewable, and it’s a supreme natural insulator. In fact, it mentions that cork tree bark can withstand temperatures of up to 1,000 degrees Fahrenheit. This is nice for a cooler, of course, whose primary function is to ‘keep heat out’. As far as ice retention, as we mentioned earlier Sovaro coolers really do rival any of their competitors – if not surpass them. Out of many 5-star reviews on Amazon, a repeating theme was the exceeded expectations for the cooler’s ability to keep things frigid even in extreme situations (i.e. in direct sunlight or in the back seat of a hot car). Several, in fact, didn’t hesitate to claim that Sovaro beat Yeti hands down for its ice-retention capabilities (we covered Yeti coolers right here). Time-frame wise, expect a Sovaro to easily be able to keep ice for 4-5 days (if not in direct sunlight). As far as luxury goes, Sovaro coolers are genuinely cream of the crop. But what really makes a luxury cooler luxury? 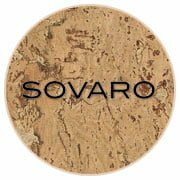 Sovaro rightly earns the ‘luxury’ label from its sleek style, aesthetically appealing design, eye-catching elegance, and no-holds-barred use of premium materials such as chrome and (of course), cork. Multiple Amazon reviews rave about how many comments and compliments the coolers get when out in public. Even ‘non-cooler’ aficionados are quite likely to stop and ponder, “dang, that’s a nice cooler.” They really are that striking. Sovaro coolers come in three different sizes (30, 45, or 70-quart), and primary color options of black or white. Silver or chrome accents are available on the black coolers, and gold or silver on the white ones. So essentially, there are four different color/accent variations available. All Sovaro coolers come with a durable, transparent divider that allows you to organize the cooler’s contents into separate compartments. The 45 and 70-quart models have two different divider slots, allowing for three separate compartments. The second divider is considered an ‘option’, though, and is sold separately. Another really nice feature is the optional prep tray. This spans across the top of the cooler and provides a nice storage area for fruits, cheeses, deli meats, etc. 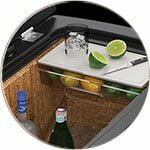 It also acts as a stable mini ‘countertop’ that is great for slicing fruits or preparing cocktails. Sovaro ice chest can be purchased online directly through the Sovaro website, or from Amazon. At the time of this writing, each size and color/trim option is available on either site for the same exact price. Amazon, however, has the option for interest-free monthly payments and their shipping works flawlessly. The gold and chrome accents are considered premium trim options, and cost a little bit more than the basic silver trim. For your convenience, here’s a link to all Sovaro coolers available on Amazon. The bottom line is Sovaro coolers are a genuinely state-of-the-art, top-of-the-line product that combine unmatched style, elegance, and sophistication with exceptional performance and durability. Yes, the prices are a bit breathtaking for the average joe. However, if money is of no concern, your investment in a Sovaro luxury cooler will guarantee to turn heads and garner compliments wherever you go – not to mention offer truly top-shelf functionality and dependability. 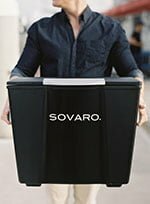 Bonus: Here is one of Sovaro coolers commercial – it gives a taste of the luxury behind the Sovaro ice chests.